Sapa has been becoming a major tourist destination of north Vietnam, a natural starting point for the unique experiences in the mountainous area, which includes the Hoang Lien Son mountain range, Indochina’s highest peak of Fansipan (3,143m) and 5 different hill-tribes, each one colourful, distinct, and with its own language and cultural values. Some of the villages, especially the more remote ones, are still largely untouched by modern ways of life. The main attraction in Sapa is to visit the hill tribe’s villages. There are many unique opportunities to experience the hidden trails, breathtaking sceneries, unmixed culture and way of life…but without the availability of basic accommodation. You can either sleep in local houses, or in tents outside the villages. Here began our idea of building the Ecolodge. 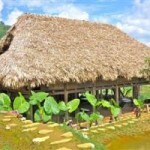 Topas Ecolodge is now the only one of its kind in Vietnam. It has a perfect location – situated atop two cone formed hills, set deep in the spectacular Sapa valley of northern Vietnam. Topas Ecolodge is based on sustainable principles to ensure that the lodge has a minimum impact on the surrounding environment. Topas Ecolodge employ local people and use local products and goods, in order to bring economic benefits to the local community as well as we have implemented a wastewater facility to avoid pollution of the local area. 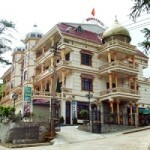 Topas Ecolodge is situated 18 km outside Sapa town and the bus ride is approximately 45 min. It called “adventurous bus ride” mainly because the road conditions are not too good, but also because you’ll meet many of the ethnic minorities of this area and probably a few buffalos. It called a ‘lodge’ because it is not an ordinary hotel. The bungalows have no TV or other entertainment and we have no swimming pool or spa facilities. 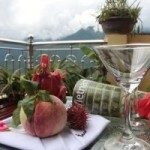 Topas Ecolodge is located approximately 18 km from Sapa town. 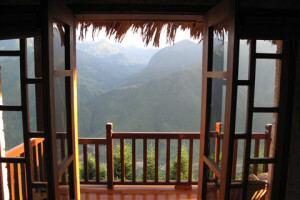 Because of this distance, Topas Ecolodge has made sure guests do not necessarily have to go to Sapa. Among facilities is the restaurant, which serves meals all day as well as our bar, where you can buy drinks and snacks. 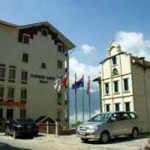 Furthermore Topas Ecolodge have a free bus shuttling between Sapa and the lodge. The restaurant is two old traditional Tay stilt houses carefully moved piece by piece from its original site and reassembled at the lodge with more equipment to meet modern standards while respecting its original and historical qualities. The restaurant serves three meals daily for up to 70 guests, either served as a set menu or buffet. The breakfast is primarily international and includes among other fresh baked bread, homemade jam and fresh made juice. The lunch and dinner menu are though, mainly traditional Vietnamese dishes, such as spring rolls, banana flower salad, morning glory, and steamed rice. In the winter time, Topas Ecolodge provide gas heaters to keep our guests warm. Lounge is in the same Tay stilt house as the restaurant and is often the meeting point for guests. In lounge you will find our bar that offers a range of beverages and snacks. You will also find different games and entertainment for your amusement. If you prefer to relax with a book, Topas Ecolodge have a small library where you are welcome to borrow a book. Furthermore Topas Ecolodge have free Internet access through both WIFI and guest computer. In the winter time the hotel start the fire place to keep the place warm. Employees are young people from local minorities and not all are equally proficient in English. Topas Ecolodge often experience break down of the power supply and during the rice planting season we struggle with the lack of water. Sometimes the weather is clear and sometimes it’s cloudy – and it can be even muddy. However, Topas Ecolodge has a very unusual location with a spectacular view and lots of unique trekking and mountain biking trails in our backyard. Topas Ecolodge invites people out here to experience Vietnam in a different way and to escape the busy city life for a true and quiet mountain getaway.